Midnight Sun provides a fully guided trip in western Alaska on one of the Yukon’s largest tributaries. 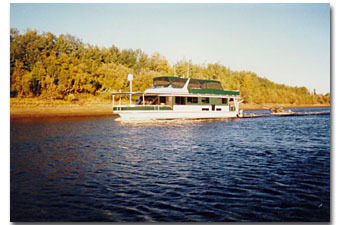 Your trip takes place aboard our beautiful 67 x 16 foot houseboat called the “Midnight Sun”. Providing a new twist to sport fishing in Alaska; this boat is designed with all of the creature comforts and modern amenities for up to four guests per week. The boat has four staterooms, each sleeping one guest. Each room is set up with two twin beds, reading lamp for each bed and storage for clothing and personal items. There are two bathrooms providing full shower, sink and commode facilities which are shared by all guests. Meals are hot, hardy and homemade. After a long day of fishing, you are met by appetizers and refreshments. Pork loin, roasted chicken, pasta, salmon (when available) and steaks are cooked to you liking. Breakfast is made to order and consist of traditional American offerings. Lunches are large deli style sandwiches that are sure to hit the spot. Most fishermen end up leaving with a few extra pounds. Our trip is set up for four guests per week to insure not only successful fishing but a memorable and enjoyable trip. Midnight Sun offers its guests maximum care and service with our schedule arranged to provide personal attention to every guests. The lounge and dining areas encompass the forward half of the boat and provide ample room to stretch out, relax and exchange the day’s fish stories. The lounge area is equipped with CD stereo and DVD player. The fore and aft decks are both covered and set up to enjoy a relaxing afternoon. The upper deck has a fully covered and screened in 45 x 16′ area creating a lot of space for those wanting to enjoy a bug free quiet drink and watch Alaska’s midnight sun skirt the horizon. Based in the quaint village of Aniak, this option was designed for the angler who seeks a true Alaskan adventure. With opportunity to pursue multiple fish species, travel via high speed jet boats with virtually no competition with other anglers, and rustic home like accommodations, this trip is sure to leave you telling fish tales for years to come. Our newly renovated Aniak lodge boasts all of the conveniences of home. Comfortable, bedrooms welcome you with plenty of room for all your gear and top quality mattresses ensure a good nights sleep. The large living and dining areas invite camaraderie after a full day of fishing leaves you with many stories to share. This rustic and charming cabin is right across from the river where you can stand on the banks and cast for salmon any hour of the day or night. All meals are the same high quality and diversity you have come to expect from Midnight Sun. Due to the true vastness of our fishery we are able to provide guided tent camp for our more adventuresome clients. Located in even more remote areas of the Yukon drainage, the ability to fish in areas that have never seen a fly or lure has never been more real. Large cabin tents with cots are provided per every two anglers. The cots ensure that no mud will get in your way of a perfect nights sleep by the river. Meals of equal quality to the house boat including steaks, are cooked and served in a screened-in tent with dining table and chairs for home like comfort. After dinner you can take a hot shower to clean off before sitting down to a nice warm fire. Fresh cold drinking water and lavatory facilities complete the perfect Alaskan fishing camp. Groups of four are optimal. Sleep peacefully at night to the sounds of nature and see pike takes during the day that are jaw dropping. While you enjoying a float down the Aniak River, camp is set up by our pre-float guide. Each night you’ll experience a new location near great bank fishing and beautiful views. Large cabin tents with cots are provided per every two anglers. The cots ensure that no rocks or gravel will get in your way of a perfect nights sleep by the river. Meals of fresh fish, pork, and steaks are cooked and served in a screened-in tent with dining table and chairs for home like comfort. After dinner you can take a hot shower to clean off before sitting down to a nice warm fire. Fresh cold drinking water and lavatory facilities complete the perfect Alaskan fishing camp. Groups of two to six are no problem, four being optimal. Sleep peacefully at night to the sounds of nature and see sights during the day that are awe-inspiring. From the Midnight sun you will board our smaller 18 ft custom built skiffs outboard engines. These boats are equipped with the latest in electronics, remote-control trolling motors, huge casting platforms and pedestal seats. There will be two anglers and one guide per fishing boat. Based off of water temps, bait, wind direction and forage your guide navigates the many miles of river to find your monster pike. Weed beds, sloughs, submerged island and points are just a few places a well placed lure could be rewarding. Top water fly fishing, giant flies even giant rubber swim baits are all tactics used on the Yukon’s giant tackle crushing pike. The greatest part about Yukon pike fishing is the 50″ monster could literally be any cast. The Aniak River is truly god’s gift to passionate fishermen. You will be rewarded with all salmon species, huge rainbows, and the most beautiful grayling and char you will ever see. Our highly experienced guides will take you for the ride of your life on our custom jet boats through channels and log jams. Our jet boats are 20′ flat bottom skiffs with outboard jet pumps. These boats are designed for shallow running quick turning. With these features they allow access to the best parts of the river for fishing. The custom skiffs are designed to fish 4 anglers at a time. Wade fishing and drift fishing is utilized along with many other tactics for targeting trophy trout and salmon. After breakfast at the lodge, your party and your guide will take off on an exciting ride up river. Stopping at all of the great spots on the river your day of fishing will be exciting rewarding. Fish for as few or as many days as you like. Catch and keep your limit. We’ll clean and pack your fish so you can remember your trip all winter. Flowing through 80 miles of the Kilbuck Mountains, untouched wilderness and wildlife habitat, your seven day Aniak river float begins at Bell Creek via wheeled plane. From the bell creek put in you reach the Salmon River. Slow and winding the Salmon River hosts excellent fishing and wildlife viewing. Trophy Grayling fishing ensues as they riddle every pocket of water you can see. The closer that you get to the Aniak confluence the more salmon, rainbows and char you catch. Here waters are clear and full of structure. Dry fly fishing is a must in this section. Mouse patterns and large leech patterns also trigger fish to attack. Once the Aniak meets up with the Salmon, the river transforms into a large swift flowing paradise. Braiding channels, confluence seams, riffles and drop-offs make the fishing diverse and plentiful. Float the Salmon River, mouth of timber creek, mouth of the buck stock the amazing Aniak. Whether you spin fish, bait cast, single or double hand fly rod, this river promises not to disappoint. There is a reason why Alaskans try to keep this river a secret, it is that good. Our inflatable rafts are 14′ self-bailing rafts. Each raft is outfitted with the best frames and custom bells and whistles for your comfort and fishing ease. On the Float tour each raft fish two clients and one guide to row. This way you will be able to cast to every pocket and eddy seam you could imagine. Our guides are experienced and knowledgeable. We rate above proficient in all aspects of all styles of fishing. 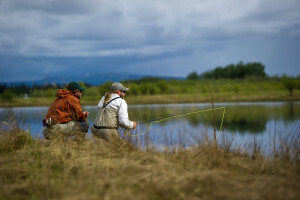 We live to catch fish, and would love the opportunity to offer a few tricks of the trade or our favorite fly. Our guides are coast guard licensed, hand picked professionals specializing in finding and catching Trophy pike and Sheefish. Call 1-903-249-8486 for more information on how to book your next vacation destination.